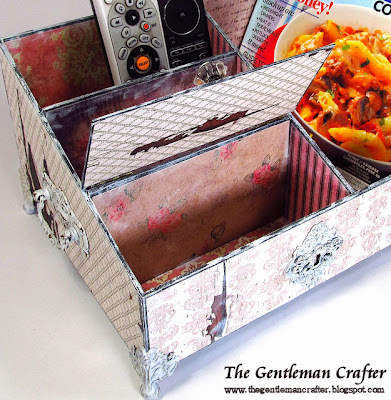 The Gentleman Crafter: Carol's Caddy! A New Project- Done! As promised a brand new project for the month of August! 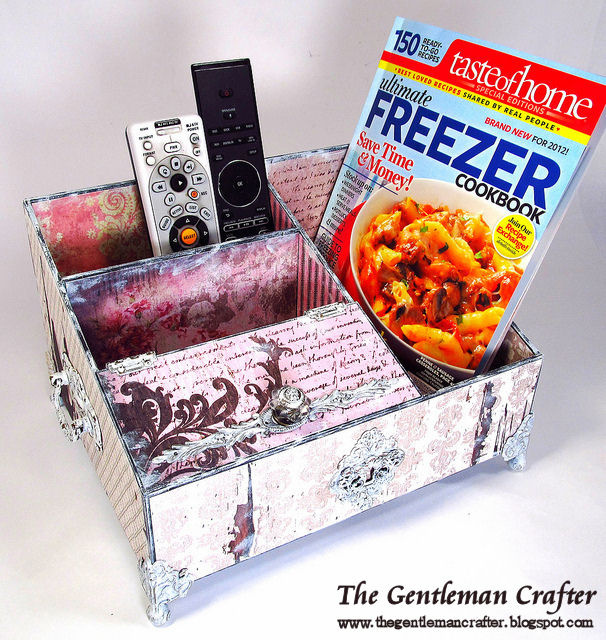 My friend Carol over at Scrapadabadoo.com asked me if I would come up with a remote control caddy for her coffee table! 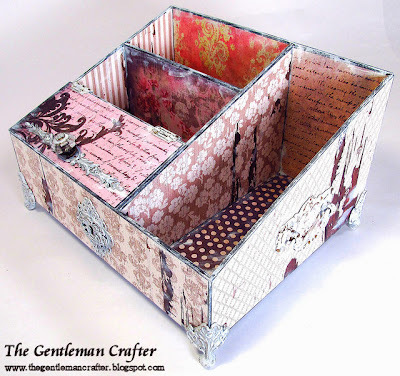 She asked that I do it with the FANTASTIC line of papers from Fabscraps that is available at Scrapadabadoo.com. Fabscraps has so many cool papers from a variety of their collections and they work so well together. For me, Fabscraps hit this paper out of the ball park! It's totally amazing how this actually looks like old wall paper or old finishes that have aged so beautifully. I so wanted to distress it with ink, but the light and shabby "chicness" of it made me run for paint and a paint brush. I painted the project a darker color first, then distress it with warm white paint once the papers had been adhered. This piece would also be a GREAT organization desk system. It really has a lot of possibilities! 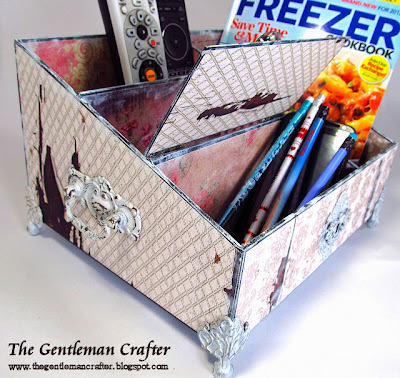 Grab some chipboard, some paper and in a few hours you could do this cool project! As always, Thank you so much for your time and support! It does look like wall paper! Love the combination of papers you used. I'm sure Carol will enjoy having that on her coffee table. She really did Sharon. I was so happy she liked it! YAY!!! So where is the link to your Etsy shop? I looked but my tired old eyes haven't found a link to click on. Another super project, Jim!! I know Carol will LOVE it!! Please post the link to your Etsy store. Thanks Barb! You Rock my friend! Thanks Tons Paul! Gotta have a place to store junk right? LOL! Good to see you my friend! So cute Jim. I know Carol is going to love it!!!!! Can't wait to hear her expressions tonight. YAY! Glad you like it Marcie! I think I need one of these. I found 4, count em, 4 remotes when I purged the house before the tile came in. Now I don't know what to do with them! This is perfect. Yay Kim! Come on over and we can make it together! I love functional things! Hugs to ya! J. Just tell me when and I will be there! Oh Carol, you lucky girl. I saw this first on the Scrapadabadoo newsletter just because I check my email first, LOL. Wonderful, that paper is fantastic. You are such on inspiration. I need something just a wee bit different, do you mind if I use your idea as a spring board? BB, Ooooh! Spring away! Go for it! That's what's so cool for me and really a blessing...You found some inspiration!! Love it! Be sure to send pics! I would love to see! Thanks BB! Sweet project, Jim! New paper?! This I'm gonna check out...can always use paper! lol And it's gorgeous paper to boot! That's for the inspiration and enabling!!! 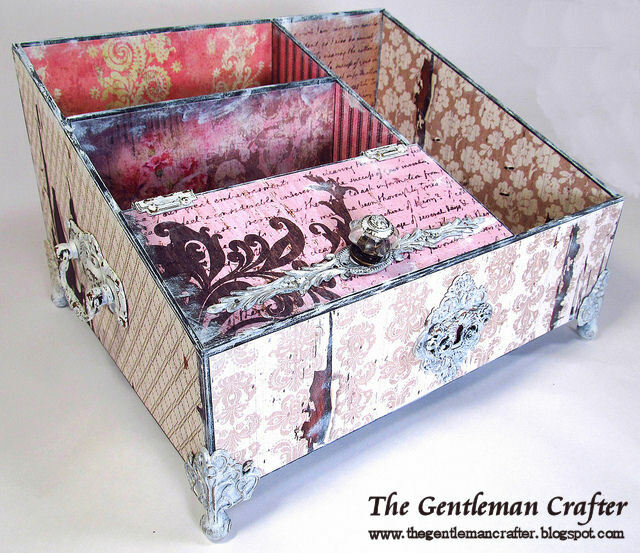 Jim, I love it, this would be great for my nail polish, files, etc. Lucky Carol!! Keep the projects coming, you amaze me. This caddy is amazing...and I'm in love with Fabscraps Paper. Great project! I see you're using the watermark? Did you try it? Genius caddy! What a gorgeous thing... and those papers look well worth checking out. Very nice! I've just got the fabscraps high tea collection papers and they're lovely too. Nice! Never heard of Fabscraps...I dare not begin another addiction! Perfection...a work of functioning ART. What a great idea! I just bought your tutorial! Can't wait to see more! Love the "functionality" of your projects ! Beautiful and awesome caddy! I love your style and talent! I can't wait to get started! Jim, just finished the tutorial, loved it - and your structure strips! Fionna mentioned them, but not in which video one could find them - so lucky for me here they were! Wonderful work you do and I really appreciate your generosity in sharing the details with us. OMG - I don't know how I missed this, but it's gorgeous! I don't want to make it myself..............although I can. I'd much rather you simply make me one. I'll have to go check out your Etsy.